At long last I have completed my Thomas Maddock's Sons Co. project. It was unusual in various ways, not the least of which being that I had the faucet and trim but not the fixture. It is almost always the other way around. I ended my previous blog post concerning Thomas Maddocks, "Learning Thomas Maddocks and more", with the question, "anyone have a Madbury for sale?" That was a few years ago. I had an opportunity to pick one up last year but it was in Roswell New Mexico and I am in Portland Oregon. I don't mind a road trip but the timing was never right. Then about three months ago I got an email from someone in northern Cal. 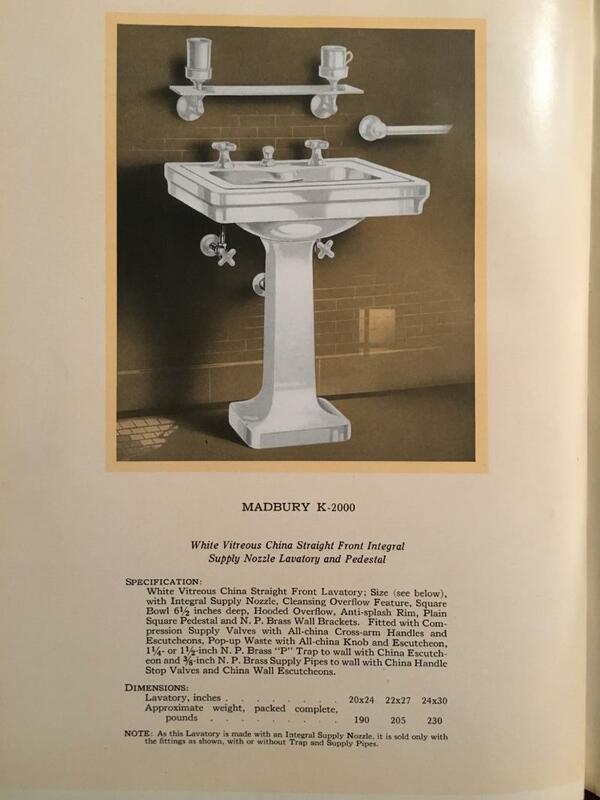 who had one with non-original faucets. He wanted to complete his Madbury with the proper trims but as we discussed it he decided it would be too much project for him and it was too remote for me to do the work. 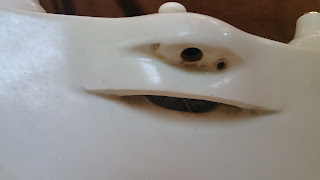 In the end he decide to look for an easier vintage integral spout fixture as the thing he was most interested in was having something with an integral spout. That left his Madbury available. He let me have for what I consider to be a wholesale price. I offered two figures, a fair price and a price that was better for me. He accepted the latter, saying he "wanted the fixture to be completed". An arrangement was made for me to meet his friend half way, in Eugene Oregon, to pick the fixture up. I was very excited, and even more so when I saw it. It is in terrific condition. 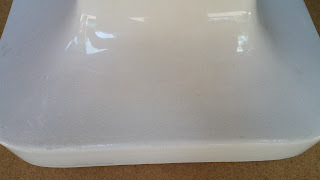 Not only are there no chips or fractures on the basin or base, there is the most interesting crazing I have ever seen. It took me a while, working with the fixture, to notice that there are a few runs of glaze that flowed out of the bracket anchor holes during the last firing. One of these formed a small drop at the back edge of the fixture. This drop is clear glass which tells me that he last glazing was in clear glass. This, at some depth below the surface, crazed. Being below the surface however the crazing does not detract from the glossy sheen that the glass finish give the fixture. 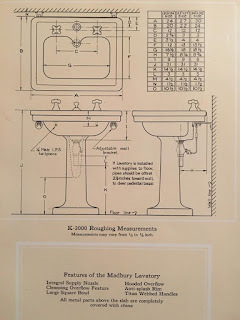 The crazing of the base is finer than that of the basin, the basin displays broader lines. to my eye, the intense crazing of the base is exquisite. I began work on it as soon as I got it back to my shop. I had to make the rubber gaskets that seal the valve bodies to the china as the china is the water porting with an integral spout fixture. I also had to make the threaded brass fasteners that hold the escutcheons in place under the handles. I had to select a pop-up assembly that was the proper size, cast brass, and the right vintage. 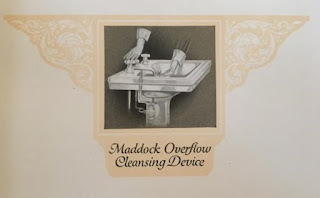 There was no way I was going to find an original Maddocks drain assembly or wait on one to come to me. I had a fixture to build and the right drain assembly could always be swapped in if one were to show up. I had seven or eight parts that needed to be plated in polished nickel as well. As the parts were made ready they were placed into a "job box", as I do with my client's projects. In the meantime the fixture had been washed, any paint, plaster, or old putty had been removed. The measurements are actually approximations. Of the three sizes listed, this is the small. These are images from my 1924 Thomas Maddock's Sons Co. catalog. They show the intended installation and the manufacturers specifications. The distinctive thing about the fixture is that no metal shows above the basin deck when the facet is not in use. The handles and drain pull are skirted to hide the metal fasteners. The old valve bodies have been given new seats and stems. All of the china trims are original. I made the threaded escutcheon fasteners. The integral spout of this fixture is above the overflow inlet. 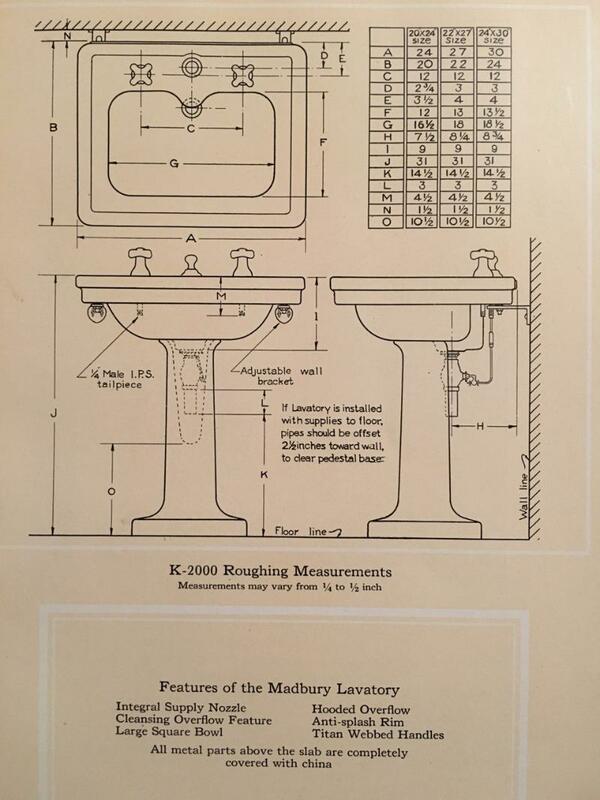 When plumbing was first being brought into the average home many things were done to show how sanitary it was. Everything was white white white. 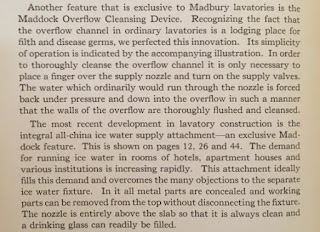 Maddocks went so far as to hide the metal fasteners to give the product a sanitary look. 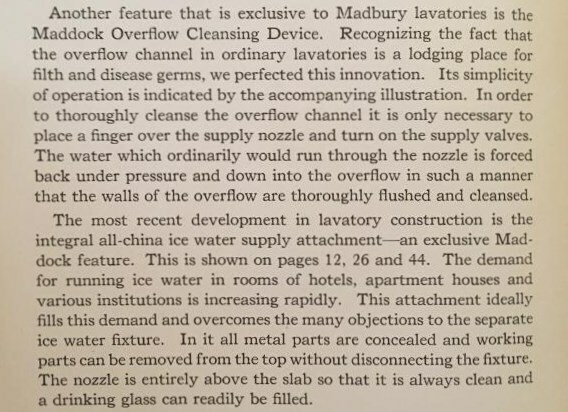 The overflow channel, where germs could hide, could be flushed with running water if you had a Madbury.